The bestselling inspirational graduation book, now available for the first time ever in the New International Version . To be successful in their journey, high school and college graduates need insightful wisdom and God's direction as they tackle new challenges and embrace new opportunities. God's Promises for Graduates is the perfect gift for graduates, providing encouragement and direction in their faith for a brand-new road in life! For over 30 years, the God's Promises series?which has sold more than 15 million copies?has been guiding and comforting people through topically arranged Scriptures addressing many facets of life. This book includes major topics such as character, integrity, loyalty, focus, respect, perseverance, and more. This keepsake gift has ?2014? stamped in platinum foil with a special section for journaling, ribbon marker, and silver-gilded edges. Year after year, God's Promises for Graduates is the bestselling title for the graduation season! 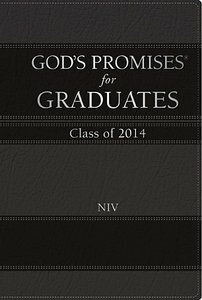 About "God's Promises For Graduates: 2014 - Black (Niv)"
Jack Countryman is the founder of J Countryman, a division of Thomas Nelson Publishers, and bestselling author. He created God¿s Promises® line with over 9 million copies sold to date. He¿s author of If My People, I Will Love You Forever, and God¿s Promises for the Graduate. Jack and his beloved wife Marsha, who shares this journey with him, have 2 grown sons, Bret and Jason.